Last time I took the 1934 PD Two Seat Tourer out for a run, I thought the brakes weren’t quite functioning properly; yes they worked, but I wanted a bit more. I mentioned this to another member, and we started to think about problems with the lever. Back home, the Seven was put on the trailer so that I could get a good look underneath. What I found was a bit of a surprise. 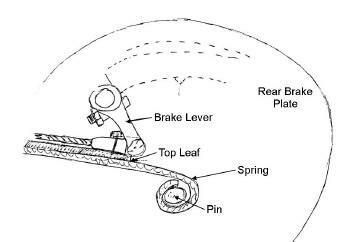 Refering to the sketch: As you look onto the backplate, you can see some clearance between the top edge of the leaf spring and the end of the brake lever. As the cables are tensioned by the pressure on the brake pedal, the ball passes above the spring as the lever is tugged forward and the brake cam rotated. Worse than that; as all the slack in the system was now taken up, none of the other three brake levers were getting any more pull either! A problem at one brake is causing all four to fall short of maximum stoppage. A bit of investigation led to the cause. The brake shoes were a little bit worn, not excessively, but more than they were and requiring just a little shimming. Hence, the lever was having to travel just a bit further than it has in the past. Being a lever, a tiny bit of wear at the shoe end resulted on a lot of extra displacement where the lever meets the cable. This had become a problem as, at sometime in the car's life, new springs were fitted at a time when owners bought what they could get, and they weren’t quite so fussy about tolerances. Hence, the rear springs are made of leaves which are thicker than either the Austin originals or the quality reproductions now available. The result is a lack of clearance. I was able to reposition the lever a little bit so that it never fouls the spring, and it can pass cleanly by. Something to look out for, next time you’re underneath. This article, written by Mike Davies, originally appeared in CA7C Seven Focus in December 2015 p15.